Affirmations are a great way to keep yourself motivated to reach whatever goals you have set for yourself in life. Use this application to create affirmation slideshows that you can view as often as you would like. 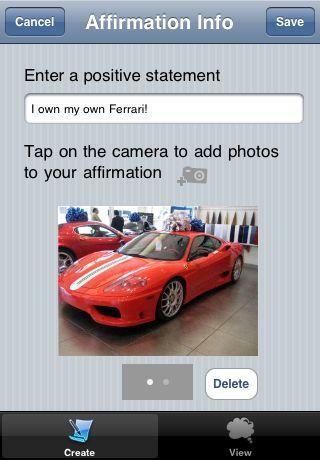 - Add pictures from camera or album to each affirmation. 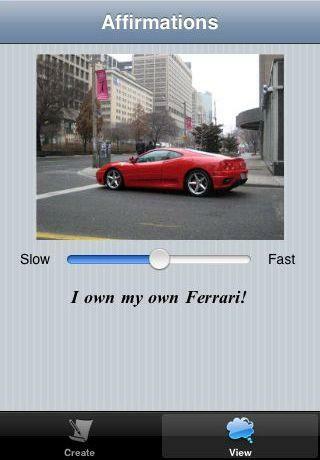 - Multiple pictures can be added to a single affirmation. For more comprehensive help with your goal planning, try out our Goal Manager app, which features this Affirmations program built in. Please leave comments and suggestions about this app here. 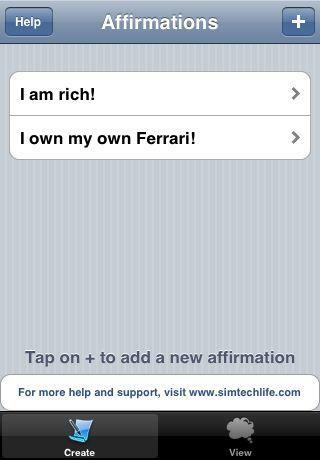 From the main page you can add new affirmations or view and edit the affirmations you currently have. Begin by entering a positive statement that you would like to be displayed in the slideshow. You may also choose to add a picture to it, either from your camera (iPhones) or from your photo library. You can change the speed of the slideshow by using the slider bar under the picture.